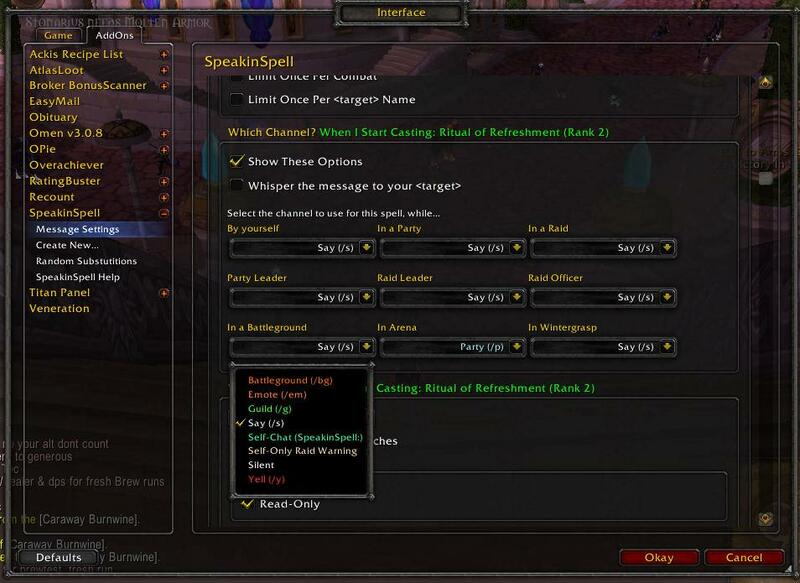 Funny and/or Useful, SpeakinSpell will use random speeches in chat to announce when you use spells and other abilities, as well as items, procced effects, other events, and user-defined macros. Works with all classes. Configurable for many different situations. Records more event hooks as it discovers more spells, buffs, and debuffs, etc the longer you use it. Supports different channel options (or silent) in different scenarios: solo, party, party leader, raid, raid leader, raid officer, BG, arena, and Wintergrasp. Includes some default example speeches for at least a few spells for all classes. These are only meant to serve as examples. In general, very few default speeches are available for most classes, so you may not see it do anything for you right away. You should look at the list of possible event hooks under "/ss create" and write your own speeches. How do I make a backup copy of my SpeakinSpell data? How do I erase all the defaults and start from a clean slate? Type "/ss eraseall" to erase all your data. This includes any defaults as well as any custom speeches you've written. How do I find the spell or other event that I want to change in this huge list? Cast the spell, or trigger the event, then type "/ss recent" then use the click-able links in your chat frame to [Edit Speeches] or [Setup New Event]. How do I stop it from announcing this spell or other event? Cast the spell, or trigger the event, then type "/ss recent" then use the click-able links in your chat frame to [Edit Speeches] for that event... then click the button that says "Delete this event"
OMG this is so complicated! Hey! That's not a question! It's a common complaint though, and I'm open to specific suggestions about what you find is too complicated, or confusing, or could be made easier, more intuitive, or more user-friendly. With great power comes great complexity. Everything is labeled with detailed tooltips, and there's a detailed user manual built-in (/ss help) and online to help you out. I also usually answer questions within 24 hours. Login and play your toon for a few minutes. Activate any abilities, trigger any procced effects, and encounter any other detectable events that you would like SpeakinSpell to announce. Select the desired spell or event from the list and click the Create button. You will be taken to the settings page for that spell or event. Change the settings to your tastes and write as many speeches as you want. Now whenever you cast that spell or encounter that event, SpeakinSpell will say one of your random messages for that event, using the channels and other rules that you defined. Repeat until you run out of ideas for new announcements to write. At any time you wish you had the Setup Guides enabled to catch a special proc effect or something, type "/ss recent" to see Setup Guides for the last 5 events detected, and last 5 events announced. Type "/ss help" for the in-game user's manual for complete, thorough instructions for how to make the most of every feature SpeakinSpell has to offer. It's designed for maximum flexibility. Supports over 50 substitutions in your speeches, such as <caster>, <target>, <zone>, <spellname>, <party2pettarget> and many more. Also includes random substitutions like <randomfaction> (like Mad Libs™) and you can create your own random substitution word lists. Up to 100 speeches can be entered per spell. When you get compliments on your "macros" use "/ss ad" to tell your friends about SpeakinSpell. Some of the random ads are funny. Yes, it's an addon that spams random text in chat, and it has a feature to spam random text to advertise it's ability to spam random text. "/ss help" in game for more advanced options for using /ss ad. Detection of "other events" such as Login, entering combat, changed zone, and more. Type "/ss help" in game for the complete list. Custom Defined User Macros. Type "/ss macro something" to make SpeakinSpell detect a pseudo spell event called "When I type: /ss macro something" which you can setup to be announced with random speeches like a spell. This can be used for randomized battlecries (/ss macro battlecry), greetings (/ss macro hi), farewells (/ss macro bye), or anything you want to define (/ss macro _blank_). type "/ss help" for help. SpeakinSpell has many more features than those listed above. Click here for the Complete User's Manual, or type "/ss help" in-game for the same info. NOTE: If "/ss help" doesn't work, you may have an installation error, or you may have too many addons installed. Try right-clicking the minimap button, or hitting: Escape > Interface > Addons > SpeakinSpell. Please submit a ticket for any problems, bug reports, or feature requests, or feel free to post in the comments below (but tickets are easier for me to remember to fix). Submissions Welcome. To submit content including the witty random speeches you wrote, please read this. If you are a translator with better translations, please use this localization tool. More Technical Information: If you're a programmer interested in understanding more about how SpeakinSpell works, read the SDD.doc in the SpeakinSpell addon folder. It's a software design document in the (compatible) MS Word 97 file format with details about the system architecture. The official SpeakinSpell Forum http://www.rismisner.com/forum/viewforum.php?f=3 - Unfortunately, the SpeakinSpell forum is currently disabled because it received an excessive amount of spam advertisements (about 80 per day and only about 1 real post per month for 2 months). I will need help or time to learn how to adequately block advertisers before re-opening it. Thanks for the open license guys! I hope you like what I did with it. Blizzard Entertainment for this great game! ... hire me?? SpeakinSpell is made from 83% Recycled Materials. No animals were harmed in the making of this addon.